In 1991, New Canaan resident and renowned musician Paul Simon experimented with his music by recording an album with Olodum, a Brazilian group famous for a sub-style of samba heavy on percussions. "Rhythm of the Saints," recorded in the Brazilian city of Salvador and dubbed samba reggae by some, hit the top of the charts and influenced the work of many musicians around the world. More than 20 years later, one of those musicians and a Salvador native has joined the list of New Canaan's award-winning musical celebrities, and he's at least the second in town who's worked with samba reggae, after Simon's "Rhythm of the Saints." Nanny Assis, an acclaimed Brazilian jazz musician who moved to New Canaan in June, was recently nominated by the Brazilian International Press Awards for best musician and best male performer in the United States. In 2011, he won the best male performer category. Besides singing, Assis plays the drums, percussion and acoustic guitar. Assis, 44, was born and raised in Salvador, a city on the northeast coast of Brazil known for its warm weather and internationally popular Carnival celebrations. Three years after Paul Simon recorded an album there, Rolling Thunder, an American band which wanted to produce a samba reggae album, invited Assis to tour Brazil with them. He joined them as a percussionist and ended up staying with the band as a member for concerts in the United States and Europe. In 1999, he was invited to join the Mount Moriah Baptist Choir of New York City's world tour. A year later, he toured the world with musician Vinicius Cantuaria. Some of the destinations were Italy, France, Spain and England -- including Queen Elizabeth Hall. Assis then decided to settle in the U.S., so he moved to New York that year. Since then, New York has been his artistic hub, but he continues to perform all over the world, including his new home in Fairfield County. George McEvoy, a New Canaan pottery artist, met Assis at a performance at the Darien Library last year. Since then, the two have become friends and McEvoy and his wife have seen Assis perform live at least six times. Besides talent, McEvoy said, Assis brings a lot of energy and charisma to the stage. "His music is terrific," McEvoy said. "Besides being a good technical musician, he's somebody who has magnetism when performing." Some call Assis a "world music" performer. But he prefers the label "Brazilian jazz." He said world music is too vague. Assis also performs bossa nova and a number of different Afro-Brazilian styles. Assis said he's wanted to live in New Canaan since he left Manhattan in 2009. One of the reasons was the town's renowned school district, he said. Assis, who has a 12-year-old son and an 18-year-old daughter, knew the New Canaan schools were top-notch, and he wanted to provide the best possible education for his children. He didn't move to New Canaan earlier, he said, because he couldn't find affordable housing. After being on the waiting list for the New Canaan Avalon for four years, he finally got called this year. From 2009 and 2013, he lived in Stamford. Besides the school system, Assis said he was searching for "tranquility," something he said he couldn't find while living in Manhattan. "Every time I got out of a gig, I didn't feel like I was going home because of all the crowds and noise of the city," Assis said. He also said the small size of New Canaan makes him feel closer to nature, something he misses from his life in Brazil. "The feeling of being close to nature was a big factor in my decision," he said. "It's important to leave work and have a home to relax." Nature and homesickness are actually recurring themes of his songs. But Assis also writes about social issues, as in "Revolução Rural," and love, as in "Melhor Refrão." Both songs were in his 2006 album "Double Rainbow." His other album, recorded with jazz musician Arthur Lipner in 2010, is titled "Brasilian Vibes." Most of his music is in Portuguese, but he said he's planning to write more in English in the future. Assis started playing music when he was 9 years old. He would play the drums at a Baptist church where his dad was a pastor. He only found out he could sing when he was 16. "Singing happened accidentally," he said. At that age, he was playing with a samba music orchestra. One day, one of the singers didn't show up, so he offered to give it a shot. From that point on, he was one of the official singers for the orchestra. One of key differences about being a musician in the U.S. rather than in the Brazil is the type of singing, he said. "In Brazil, it's more about the way you sing," he said. "Here it's about the intensity." Assis does not plan to return to Brazil. "I'm American now. I'm more familiar with the musical scene here." In New York City, Assis has performed at B.B. King, Zinc Bar, Birdland. He's also played at SOB's in SoHo on Sundays for about 10 years. "New York is a place that every musician should live for at least a year," he said. "Most live jazz albums I used to hear in Brazil were recorded in New York City." 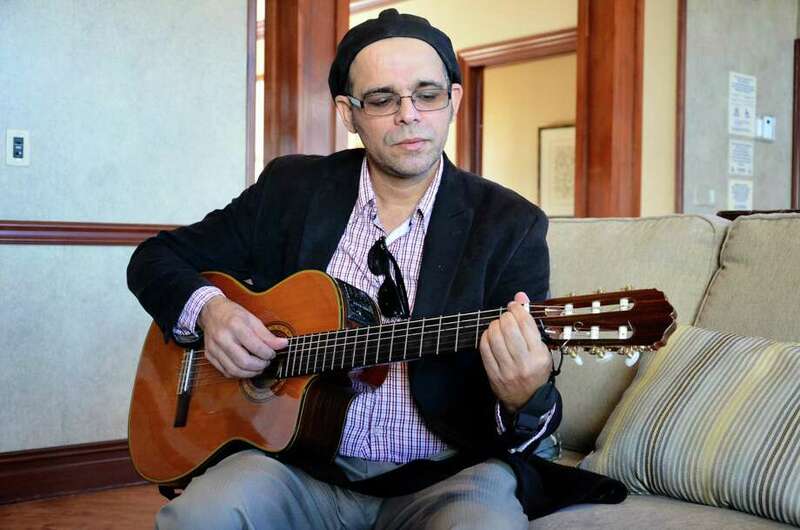 New Canaan residents curious to see Assis perform will soon be able to learn from him. Assis said he's about to start teaching percussion at the New Canaan YMCA. He is performing at Roger Sherman Inn -- 195 Oenoke Ridge -- this Friday, Dec. 27, at 8 p.m.